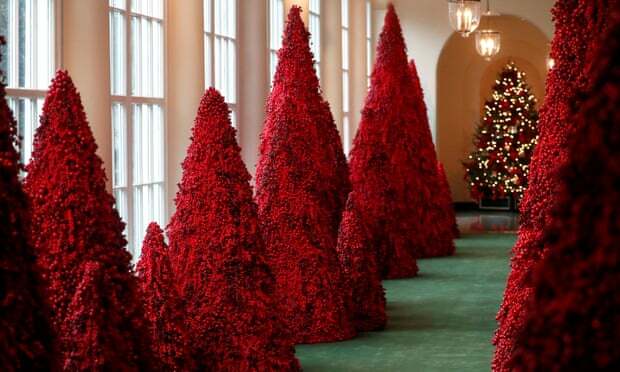 I can't erase the image in my mind of Putin strutting down Russia's Promenade of Conquest - you know the one lined by red Christmas trees at the Whitehouse. 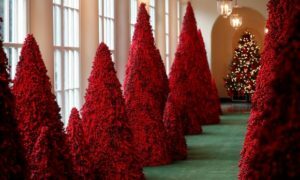 To really get the full effect you have to watch the video from I think it is either the Times, Newsweek or some other news organization as they do a pan down the long promenade of red Chrismas tree. Then I have to listen to commentators say it is not acceptable because it is blood red - it is a scene out of a horror movie. Another commentator said its unacceptable because it is so jarring from our expected green Christmas tree and psychologically jarring and damaging. And then, of course, I listen to Mrs. T blather about the color red being the color of valor. It's Russian Red, Kremlin Red Square red. In my mind, Putin struts down the promenade of conquest at the White House and out to review the Soviet Military Parade. With all of the Russian allegations swirling around him. Especially now that Robert Muller seems to be closing in and several of Trump's inner circle have testified under oath that Trump asked them to reach out to Putin you would think Trump would have whispered to Milania - "please not red Honey, not Now." The only conclusion that I can come to is when Trump said he could shoot someone and his supporters would still stand behind him he really believes he can get away with everything. Including giving away our country, giving away the United States to Russia. Of course in the bargain, he gets a Trump Tower in Moscow that reports say will enrich him by several hundred million dollars - and all he gives Putin is a penthouse apartment in Trump Tower Moscow and of course the United States of America. But that's all Trump cared about from the beginning - enriching himself. Don't let all of this recent noise about Trump's high-level changes at the Whitehouse divert your attention from what's important. Trump was willing to bargain away our country - yours and mine to Russia to enrich himself. It's just a pattern - whenever the news is not in Trump's favor he gins up some controversy to distract us. But thank goodness some of the media and some of the voters are not falling for Trump's game and keeping their eye on what's important. Please remember to Confirm. Your Confirmation Email is on its way. Will Predator in Chief Trump be Brought to Justice? Lock Him Up! Another Trump Gift to Russia – Payback For What?